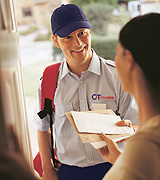 The C&T Webticket is our internet order entry system that allows you to bypass the hassle and time of countless telephone calls and get straight to our courier dispatching system to expedite your courier needs. The innovative web-based system remembers key data and makes scheduling courier deliveries more efficient, getting you back to the important things – your business. Using our simple web-based forms, just a few clicks and your delivery is scheduled! 3) select the type of service and time frame, and our system can dispatch a driver instantly and even calculate the price for you! Save Time: Input all of your commonly used addresses and information one time and have them saved for quick shipments in the future! Reporting Features: The Webticket system offers users great reporting options to keep track of billing and client shipments. Choose from client activity reports, caller total reports, reference total reports or even an invoice report. Track It: Webticket can give you the status of your delivery by simply entering your ticket number. You can even track your delivery down to the street level using our exclusive TrackRoad.com partnership, and check for proof of delivery. Get Started: Our staff will gladly assist you in creating your initial online Webticket account to have you up and running quickly! Try it out by clicking the link below and using DEMO as a username and COAT as a password.